I believe it is the patients’ choice to decide who should know about their cancer diagnosis, but many times we patients don’t have full control over that. Bad news travel fast. I felt pressured to tell people about my cancer diagnosis and I was not happy about it. I remember having an argument with a childhood friend who I wasn’t close to because she doesn’t live in the U.S. She found out about my diagnosis through a family member and was upset because I was keeping my diagnosis “a secret.” But I really wasn’t keeping it a secret. I was trying to have some level of control over my situation and one way of doing that was to carefully choose who I thought needed to know about my illness. And besides, this old friend and I hadn’t spoken in years. I felt it was inappropriate of her to demand I tell the whole world about my cancer diagnosis. She said “awareness” was important and I wasn’t doing the “right thing” to help other women. There is no “right way” to do cancer. Patients are entitled to handle their cancer mess the way they wish to. One way to help a patient is to respect their wishes. 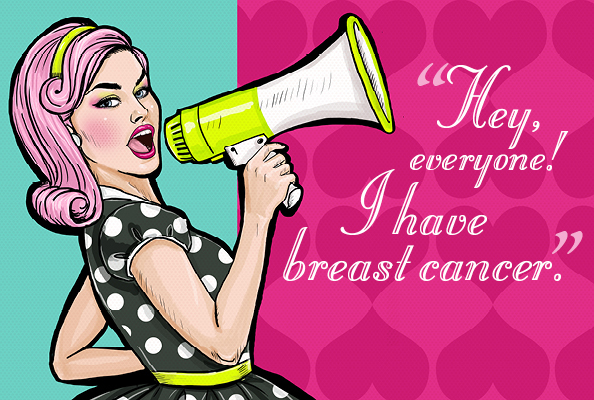 Finding out I had breast cancer was overwhelming for me. When you tell someone you have cancer, not only do you have to deal with your own emotional rollercoaster but you deal with people’s reactions too. As many of us know, these reactions can vary and some may have an effect on you that may not necessarily be helpful in your situation. In my case, I wanted to avoid those situations that might have interfered with my inner peace, and welcome those that helped with my recovery, which was my main focus at the time. There are some people however, I thought needed to know. I kept my family informed — but not everyone. Let’s be real, we all know some family members give you energy and others drain it. Some are not as grounded or understanding or cool-headed as others. For example, one of my relatives insinuated I was not “religious” enough, and that I was being taught a lesson in order to redirect my life to a better path. “Preparate!” he said, which translates to “get ready!” Did I have another choice? My family lives outside the U.S. in a country where it’s more culturally acceptable to say such things to people who don’t follow “celestial” rules. And these are the kinds of people I tried to stay away from. I thought they would bring the wrong energy to my situation. Perhaps it was unrealistic of me to think I could pull this off with my family, to keep some of them uninformed. In a way it was also appropriate for them to know about my diagnosis because they had to learn about their possible cancer risks as well. And regardless of their beliefs and level of ignorance, I still wanted their support and prayers, which I received (and for that I am grateful). So, eventually everyone knew. I informed my employer — but not everyone. I didn’t really have a choice. My plan was to continue to come into the office during treatments and try to “act normal.” However, after my second chemo infusion, I was not feeling well a lot of the times. But seriously, could I really have gotten away with not telling anyone, and simply show up to work one day with no facial hair and weighing 30 pounds less than what I was? Besides, I also needed their support, which I got. The closest people I work with knew. My situation could have impacted their workload if I was not able to fully perform my responsibilities. Also, a few of these people were close friends. Because of my long absence, co-workers started asking where I was, and eventually everyone found out I had cancer – it was expected. I informed my friends—but not everyone. I have wonderful friends. Some are more sensitive than others. While I was waiting for my biopsy results I remember chatting with a couple of them. They were anxiously waiting for the results too. Once I got “the phone call,” I told them. “I am crying,” one said to me. I immediately signed off from chat without a response. Those who I informed knew me well enough that they knew how to act with me. They also knew when not to take my moods personally. And that was very comforting for me because they allowed me to be myself. I alerted my doctors—but not everyone. My cancer hospital gave me the option of choosing which of my doctors they should keep informed about my health status. This took some of the burden off me. I let MSKCC inform the doctors I frequently saw for my care— GYN, PCP, and cardiologist. I thought it was important for them to know so they could follow-up and pay more attention to me, which they have been doing. And friends, this was about all the communication I could handle about my diagnosis, at the time. It wasn’t until I was almost done with chemo that I started to talk to more and more people about my illness. It took me almost 3 years to finally publish my blog, which I started mostly because of my struggles with survivorship. Now I am at a place where I can share my story with everyone. Some patients feel comfortable telling people about their cancer diagnosis right away and others don’t. Some patients just need time. These are acceptable behaviors because each patient copes differently. I didn’t expect people to understand why I kept my diagnosis semi-private. I only wanted my wishes to be respected. And to me, that’s a meaningful sign of support. Did you share your cancer diagnosis right away? 37 Responses to Who should you tell about your cancer diagnosis? I recognise every single bit of your post! I fully understand why you didn’t want to share everything with everyone. I had the same approach as you and for me it was a tiny bit of control at a time where I had no control over anything. Also, like you say I didn’t want to/wasn’t able to have to deal with their thoughts and emotions. Let alone simultaneously present to them the attitude they wanted to hear. Because let’s face it 9/10 people don’t want to hear how you are doing OK, but still afraid that statistically if this does kill you it will be in the next 5 years, so here’s hoping! No matter how many times they are you how you are doing. Exactly, I was worried about exposing my vulnerability to others. I was also unsure that my expectations would have been met, because in that situation, it is normal to expect some level of support and understanding. The issue is we could never guess how people would react so for me it was safer to keep the communication close to home. It feels so great to know I am not alone. Two weeks after I was diagnosed, I announced it on facebook. I did it because I was pissed off that this was happening to me and I wanted support. I got it. I was very open and still am with everyone. Mostly, it has been great and people have been extraordinary. I have had some situations that have let me down which I will be writing about in the coming weeks. But all in all, I’m glad I let the world know. It was right for me. Carrie, I am glad you handled the situation the way you wanted to. It is so important to allow patients to make their own decisions about certain things because we have so little control over the situation as it is. I am also happy you got the support you were expecting. Have to think about this. My family has a history of mental problems and we tend to see past the obvious and tolerate “damages” (which strangely are taken as a failure of the person). While I also know people can be damned heartless and judgmental I just let it slide and if people found out or asked it didn’t matter. And of course it does matter. Walking around with the door to your emotions wide open all the time is really hard and being settled about it is kind of a lie. There’s a difference between being very empathetic and intellectually knowing someone else’s pain and the closeness of being IN that pain. Maybe we just have to honor our own survival and let others think what they want? Scott, you bring up a good point about letting others think what they want. We certainly have no control over how people receive the news and how they would treat us based on that knowledge. To think of it, we can always choose to walk away — we don’t have to engage in situations that make us uncomfortable (at least those we don’t depend on). Exposing your vulnerability is always a risk but I feel when dealing with my cancer, it was all about timing. I had to allow myself to go through that process on my own terms, doing so made me feel safer. We should name her “The Woman Who Told Everyone” for this discussion. What I find interesting (and sad) are my cancer medical people who are soooo interested in my privacy. I find it liberating to talk about the good and the bad. Wonder who decided it was healthier to sit in silence? Thanks for sharing this link, Scott. “Staying in silence” is such a complicated approach, and you are right, it isn’t always healthy under certain situations. However, I think at some point one must realize how productive/effective it is to speak to a wall (I am speaking in general). I have stayed quiet about some situations that I know will never change and so decided to walk away from it.In this case, it was the healthiest thing for me to do. But it isn’t really staying silenced when you are reaching out to other people and letting it all out, even when you aren’t receiving the response directly from the people you’re having conflicts with. It is healthy to let things out but you have to feel safe doing it. You also have to know when it’s time to walk, which I understand must be a challenging thing for you to do in your case because this is your medical team. How do you walk away from receiving care? Just thought, some of this might be seen as a favor by the people around us. Take some of the responsibility of decision making off us? When did I say people could snip off pieces of me and look after them they do our cat when we are on holidays? I’ll kick people’s shins myself, thankyou. Scott, I think many people want to help but there is a struggle on how to because they do not know or understand the complexity of receiving a mortality notice. They are too afraid to face the rawness of the situation so their reactions become more “practical” because it’s what they know. I am convinced that only those who have done cancer can really get inside our heads and understand but we also cannot be too hard on the non-cancer people because they are not experiencing our level of urgency and the desperation we feel to be heard and understood. But hey, at least we have our community. I have found comfort in knowing I am not alone. Not only do they get offended about how you handle YOUR news, but they also judge your decisions (about treatments, survivorship, etc..). I had another back-and-forth with the same “friend” about why I did not do a mastectomy. You described this situation perfectly, some people make it about themselves and not the patient who needs the support. No control over that either (yikes!). I am sorry you had some difficult times with your support system. I hope you are doing well and that you are having more good days than bad days. Thank you for stopping by and for commenting on this post. Feels good not to feel alone. I did a caringbridge and apparently shared too much. It’s been three years and recently I had a few people tell me how much I overshared. Funny I never forced them to read my caringbridge. For the few negative responses I received, I did receive tons of comments from people thanking me for sharing so much. Until you’re on the cancer train, you have no idea what’s involved. It’s always up to the patient to decide how much information to expose. And I agree with you, if someone doesn’t want to know or the information scares them, then they should reconsider. I am sure you’ve helped so many people by sharing your story, and at the end, that’s what really matters. In fact, if any of those people who thought you shared too much information are ever diagnosed with cancer (and I hope they never are! ), my suspicion is they will turn to you for support. Your last sentence is spot on! Thank you for stopping by and for commenting on this post. Stay well! I shared my diagnosis with everyone for one reason. So I could get prayer to help me through. And it worked! I had so much prayer and support that I don’t think I would have done so well without it. Carla, I am glad you received great support and that you are doing well. Prayers are always welcome! Thank you for stopping by and commenting. Stay well. I love this post! Sharing my diagnosis was something I struggled with mightily, for so many reasons — the biggest of which was that my husband’s first wife died of breast cancer. Then here I was getting diagnosed too. I walked a minefield trying to figure out how to deal with MY cancer in the shadow of HERS. I didn’t know how to ask for help. It’s one of the reasons I started blogging. Telling people what was going on with me and my cancer made me feel incredibly vulnerable. I needed a safe outlet in which to explore my feelings without worrying about hurting anyone else’s, without dredging up my stepchildren’s (or my husband’s) grief. I didn’t tell anyone about my blog at first; to ensure no one found it, I wrote under a pen name. Still do. This provided me with a great sense of freedom to talk about anything and everything cancer-related, without worrying that I was sharing too much. Eventually I felt strong enough to tell a few friends about my blog. That stopped after one of them told another close friend, “Be careful what you say to her — or she’ll blog about it.” As we all have learned, people who haven’t actually gone through cancer don’t really get it and, well-meaning as they may be, can be incredibly insensitive. Finding this beautiful breast cancer blogging community has been the best thing to come out of my whole BC experience! Thanks for writing about the tough topics. I am sorry your husband has experienced this level of fear and pain. I actually joined a forum (under a different name) when I was diagnosed. There were 200+ breast cancer patients who addressed different concerns and gave each other support. It was the best thing I did for myself, because like you said, it allowed me to have a huge level of freedom. I didn’t have to worry about being judged, saying too much or hurting anyone’s feelings. Now, having a blog with my true identity was a big step for me but I felt the need to speak up about the culture in cancerland, those things most of us patients dislike. I have wondered if any of my friends have taken what I’ve said too personally — hopefully not. I do think in a way it is helpful for everyone to know how we feel about certain things so caregivers, as well as those who haven’t walked the cancer path, can support us better. Of course, I am not judging them or saying they are all clueless, but honestly, I think they struggle with figuring out how they can help. I know I did before I was diagnosed with cancer. I completely agree, our community is amazing. Connecting with others has been the best part of my nightmare too. I am happy you found ways to get support. The community IS amazing. May not sound like it but reading and responding to blogs has lowered my reactivity a huge amount. Living with a government run “socialized” medical system in a small town with few doctors leaves me to work things out myself. At first it seemed I was stuck in a corner with nowhere to turn but that defiantly isn’t the case. Realizing my medical care givers are over worked and burned out makes me angry that they feel cornered too. As far as I can see, their way to resolve the tension they must feel for having to endure short staffing and restrict care they should be giving is to pretend it all works while knowing it doesn’t. To me that seems harder than my situation in a lot of ways. This sounds kind of rude but maybe we should get accustomed to uncertainty and step away from people who can’t help us? Might be as a guy I don’t understand the nature of the hurt the women here feel? That somehow it’s possible to drop connections like used kleenex because I don’t connect so deeply? This discussion has touched on something that seemed like a control issue and who to trust. But really how independent are we? We ARE our relationships with others and thank you Rebecca for that realization. I was one of those people who wanted everyone to know. I assumed I’d receive support and I was right. However, two people put their New Age guilt trips on me and telling them what I thought in a kind manner just ended up being draining. There were invariably other comments, all well-meaning, but harmful nonetheless, but mostly the responses were caring, supportive and what I needed. I can see why people choose to withhold, though, and I think it’s smart. Whatever supports the patient. That’s what matters. Hi Eileen! I am glad you got the support you expected. I think there’s always that chance of hearing harmful comments. We do a pretty good job ignoring them while we are dealing with the cancer mess but sometimes we remember them later, especially those that make us feel guilty (one reason why many of us write about the cancerland culture). However we decide to deal with our disease is OK but some people seem to have issues with that and become judgmental. Like you mentioned, whatever supports the patient is what really matters. I shared because I share everything. I never want people to pity or feel sorry for me somI guess I just figured I would get it out there on the www and somehow teach people what I hope no one else will have to go thru but know they probably will. I also thought if I put it out there, people wouldn’t avoid me because there were no secrets. If you wanna know, just ask! That’s just me! Although publishing my blog was a huge step, I still found it easier than when I originally interacted with people at the beginning. (Even the online forums were easier!) It’s all about the “right time” with me. At the same time, it’s nice of you to share you story because it will help others out there. Glad you did things your way and that it worked out for you. I remember that I felt it was my “responsibility” to tell my family, despite the fact that most of them are, well, beyond evil. They are actually angry that I am still alive [ shortly before diagnosis, something happened, the last straw, and I threatened to expose their monstrous secrets] You do not have to tell anyone, not even your family. Vicky, I am so sorry you have family drama. I call those “emotional cancers,” because hey, they exist too! I believe what you are saying — nothing surprises me these days — I’ve had my share of issues. We live in a very cruel world and the best thing we can do for ourselves is to walk away from toxic situations. I am sorry your family doesn’t support you. At the end of the day what hurts is having those expectations. I am VERY HAPPY you are still here with us. I am sure there are many others who feel the same way. The people you call family don’t have to also share your genes. I have two wishes for you 1) you stay healthy for may more years and 2) you allow yourself to let go of anything that gets in your way of finding peace, even if it means walking away. Remember you’re not alone. Thank you for stopping by. Stay well! Sorry to hear of Vicky’s poisoned family. This damn disease isolates us I think in part by exposing us to human failings when we could use some inspiration and fellowship. Occurred to me yesterday as someone who totally didn’t their job looked me right in the face and told me I “worried too much” that in a way she was right. I turn myself over to these people and their carelessness makes me worry and doubt my faith in people; And that DOES make me sick. Being treated like an idiot then receiving advice in a way that undermines my whole self, especially from people who CLAIM to be helping me, is something I REALLY need to get away from. It isn’t healthy for any of us to endure this and I no ask for help from the “normals” who work in health care. Whether they are just tired of dealing with sick people and have developed a nasty streak or I’m displaying a wounded prey animal their inner hyena can’t resist, ultimately I need to get free of them. Rebecca, I’m so glad you have a blog where you can share what you want to. You are right: there’s no right way to do cancer and it is up to the person with cancer to decide whom to tell. Of course, as you discuss, word does spread, sometimes against our wishes. It’s wrong for someone to pronounce religious judgement — or any judgement for that matter — on you; you got cancer because you weren’t religious enough is ridiculous. This is such a valuable post and got me thinking. My family culture is to keep everything secret. My parents told me that no one needed to know. And there is a shame attached to that. So in rebellious fashion I told almost everyone. Hi Beth! A big part of my family likes to keep things in private. In fact, my grandmother always shared this quote with us (which I am translating from Spanish): “You’re the master of what you keep secret, but the slave of what you choose to speak.” I don’t always follow this though. Judging someone because of their misfortunes is just cruel — this is one reason why shame is attached to cancer. Hey! An unbelievably relevant post! Thanks for both sharing and creating a discussion. It is relevant due to recent talks with friends. It is slightly different to what has been mentioned, however, links to the topic. I am a single guy who after about 9 months of breaking up with my girlfriend have met some girls. For me, I feel a level of dishonesty exists should I not tell girls I am interested in about it, however, my friends were in disagreement. I know there is no right response, just feel it is better to let them know before anything got too serious. Apologies, for putting this over your post, just immediately connected with me when I was reading about it. Hi! First, no reason to apologize about anything. I agree with you, if I was dating, my cancer would be the first topic of conversation. My main reason is because I don’t want to waste my time. If the person doesn’t want to be involved with a cancer patient, I would like to know right from the start. But like you said, there aren’t right answers. Everyone copes differently. I hope you find a kind girl. Hi — I have been away for a while and haven’t been active on my blog for the last few weeks. I plan on coming back soon. I hope you are recovering smoothly and feeling better these days. The only advice I can give you is to ALLOW yourself to go through ALL the emotions this experience bring out. Do no suppress your feelings. It’s OK to have moments of weakness and isolation. It’s OK to cry and to feel angry. You are human and you are entitled to be yourself. Don’t let others tell you how to feel or how to do cancer. This is your unique experience and only you know how to cope with it. Know that whatever you do, as long as it’s coming from your heart, it’s the right approach. And also believe that this is a process and as time passes, you will discover more about yourself, including finding new ways to face whatever comes your way. And you will be OK. I hope you are doing well and that each day is much easier for you. Oh, one more thing! You are not obligated to share anything with anyone. This is your path and your life. When you are ready to speak, if this is what you wish to do, you will do it. I hope you visit soon and give an update about how you are. Best of luck to you! I know what you are going through because I’m getting ready to have a hysterectomy. And I said I’m not answering no phone and don’t want no visitors this is the scariest and depressing thing I ever went through. I’m very private don’t like people knowing my business not even family. Yes you need positive energy to make it through this. Hope things have gone well for you GG. I’ve never had the best of manners or social graces but find it a relief to let go of much of my independence and “allow” help to approach me. Having been been abandoned in some pretty tough situations by people I needed and placed trust in, the hesitation to call attention to myself, (in theory) does spare me the risk of further disappointment in people but at a high cost. That said, with my cancer apparently gone it’s back to my failing heart that’s between attempted repairs and I’ve lost the ability to pretend that things are OK when some brand- new heart-event strikes me. The other night crossing a windy frozen parking lot I stopped and couldn’t remember how to walk. Someone saw me standing there, assumed I was in trouble and walked me to the car for a ride home. Be strong in yourself and let people in too.